Driven forward by Obama Administration actions on energy policy, the US is finally beginning to try to tap into and harness the tremendous clean and renewable energy of its offshore ocean winds and waters in earnest. On January 3, the Bureau of Ocean Energy Management (BOEM) announced it is seeking to determine whether or not there’s competitive interest in leasing an area offshore New York that the New York Power Authority (NYPA) has proposed as a site for an offshore wind power farm. The request also seeks to gather public comments on the proposed project’s environmental impacts and consequences and how the area is being used at present. The Bureau of Ocean Energy Management BOEM, along with the Bureau of Safety and Environmental Enforcement (BSEE), is at the core of US offshore renewable energy development efforts. They were created as part of a major organizational overhaul that saw the end of the troubled Minerals Management Service (MMS). Marking another milestone in the evolution of US energy policy, Interior Secretary Ken Salazar in November 2010 announced the launch of the “Smart from the Start” fast-track offshore renewable energy development program. As part of coordinated efforts to develop US offshore wind and ocean energy resources, under the Smart from the Start program, BOEM has been working with state and local government, as well as other federal, agencies and the public and private sectors. Located about 11 nautical miles south of Long Beach, New York, NYPA’s proposed plan for the Atlantic offshore wind energy site entails construction of a 350 megawatt (MW) offshore wind farm that would supply electricity to consumers in Long Island and New York City. Spanning an area of some 127 square miles, targeted generation capacity could be increased as high as 700 MW, according to a BOEM press release. That’d be enough renewable electrical power to meet the needs of some 245,000 homes. In October, Deepwater Wind announced it had filed its final state and federal permit applications for the 30-MW, $250 million Block Island Wind Farm off Rhode Island’s coast. The firm of D.E. 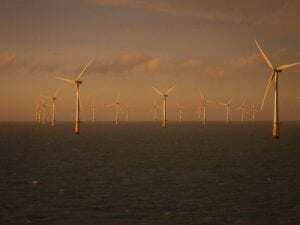 Shaw, the majority shareholder in the Block Island project, has plans to develop three other offshore wind power projects with a total rated capacity of 1,000 MW, each with the potential to meet the electricity needs of some 350,000 homes. D.E. Shaw’s offshore wind project plans include Hudson Canyon, a 1,000-MW in offshore Atlantic waters south of New York City. With regard to NYPA’s propoosed offshore wind energy project, BOEM published a “Public Notice of an Unsolicited Request for a Commercial Outer Continental Shelf (OCS) Wind Lease, Request for Interest, and Request for Public Comment,” in the January 4 Federal Register. Comments may be submitted electronically online or in written form to BOEM’s Office of Renewable Energy Programs.